Successfully Added USB 3.0 PCI-e Card to your Shopping Cart. Experience lighting fast transfer speeds like never before with this USB 3.0 PCIe card. Imagine being able to transfer an entire DVD to your USB thumb drive in less than 10 seconds. Or how about an entire high definition Blue-ray movie in less than a minute. Well, the wait is finally over thanks to this SuperSpeed USB 3.0 PCI card with transfer speeds of up to 5Gbps! The problem with USB 2.0 is that it is completely outdated for today’s multimedia demands. Transferring a 25GB Blue-ray movie using USB 2.0 will take you about 12 minutes or more. Now transfer that same movie using USB 3.0 and it will only take you about 70 seconds! That’s about 10 times faster than USB 2.0! Just think about all of the times when you where hurrying to leave your house and you wanted to throw some music or movie files onto your USB thumb drive. Only to realize that the time is getting shorter and if you wait for the files to finish transferring you will be late for your appointment. You can now say goodbye to those days. The solution is USB 3.0, and the time to upgrade is now. 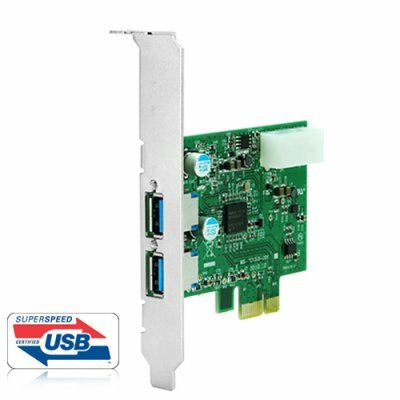 For less than $30 you can significantly increase your transfer speeds by ordering this PCI-e USB 3.0 card. And since this USB 3.0 card plugs directly into any PCI express slot, even people with absolutely no computer experience at all can easily add this USB 3.0 card into their computer! Hurry and order this product now while supplies last and we will ship out your order within 24 hours. If you are unsure about the installation please hire a professional. Excellent Resale Item, our price on this USB 3.0 card is lower than anywhere else on the internet!